The PEGASEM EBT Equipment Kit based on our Miniwheel-80 extends the scope of the PEGASEM speed sensor family to the low speed, high precision measuring range. Together with the P110 LED display it allows to acquire speed, distance and stopping time on escalators and conveyor belts. The high resolution of the speed measurement (0.01 m/s) can be used to check the correct speed ratio between handrail and staircase of an escalator. When connecting the signal from the emergency button of the tested object to the trigger input of the display the stopping distance of a hand rail or belt can be measured with high resolution. The wheel assembly is normally fitted to a solid stand with a heavy, rubber coated ground plate. A torsion spring keeps the wheel in touch with the moving belt. The wheel mounting style can quickly be changed from top-down to overhead. For quick measurements where the highest precision is not required the wheel can be easily fitted to a handle and held on the moving object. 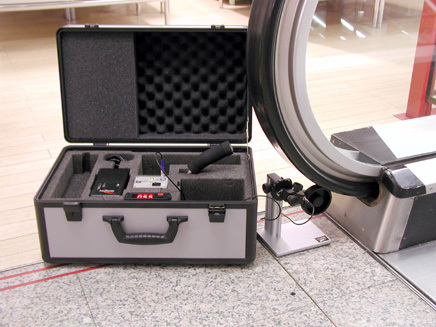 For transportation and easy usage the measuring system comes in a special case with tailored foam inserts. It includes the wheel, wheel stand, handle, digital display, interconnection box, accumulator, battery charger, manual and cables.